The philosophy of the second edition of Music! Its Role and Importance in Our Lives is a sociological approach to the study of music. It contains history but is not a historical approach. There are nine units, with a total of 27 chapters. It is activity-based with over 450 activities. 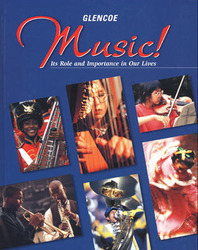 This edition fully incorporates the National Standards for Arts Education. More media and technology are added to create dynamic links with the other performing arts, and to create a variety of ways to promote composition, arrangement, and understanding of music. Internet Connections provide meaningful activities, further opening the world of music to students. A new bound-in Theory Handbook is fully integrated with the core lessons. It addresses five major theory studies, broadening the appeal of the book to band, choir, and orchestra students. Musical Instrument Digital Interface (MIDI) technology allows students to play, improvise, create, and analyze music with a MIDI sequencer. Unit Encore feature offers high-interest topics related to unit themes and introduces new music selections and activities. All styles of music are covered in the text so that students learn to appreciate the rich diversity of musical traditions around the world and within their culture. The easy-to-use text format integrates concept development with experiential skill-building activities such as identifying rhythms, creating syncopation, improvising, comparing chords, strengthening the students' confidence and self-esteem. Chapter Reviews assess student learning in vocabulary, factual recall, and critical thinking. Perceptive Listening: Internal and external aspects of music are explored (technical and cultural).